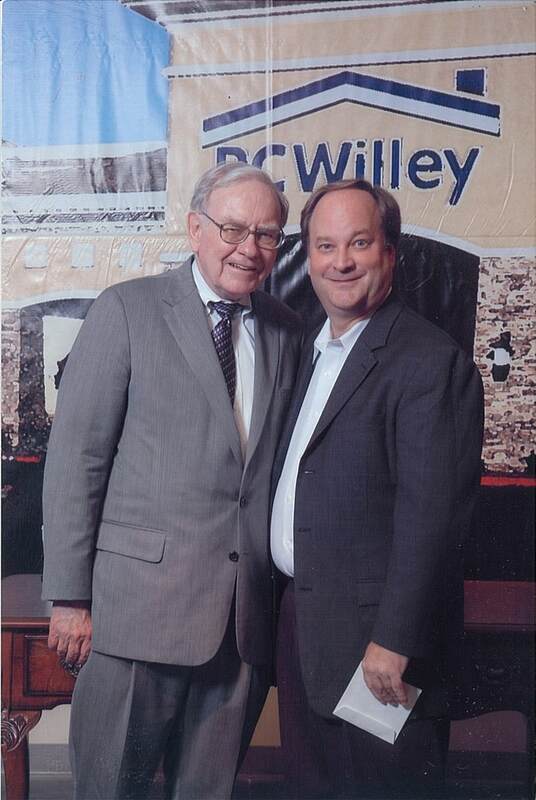 Warren Buffett with Bob Miles (Genius of Warren Buffett Course). Warren Buffett started real estate investing very early in life. At the age of 11, his first stock purchase was Cities Service, a gas station chain, now known as Citgo. At 14, he bought 40 acres of Nebraska farm land. This was before he learned the three most valuable lessons about investing taught to him by his college professor that he has applied to his investments for over six decades. Without these important principles, Buffett would not have built America’s 5th largest company. Buffett’s real estate experience and holdings are vast. His investment vehicle and conglomerate, Berkshire Hathaway, owns the second largest independent residential real estate brokerage firm in the USA. Berkshire owns the largest factory built home manufacturer, the largest single location home furnishings store, a one of a kind commercial mortgage company, and the largest commercial property and casualty insurer. Although long associated with Coca Cola and American Express, his largest common stock investment is the leading home mortgage lender in the USA. Warren is optimistic about the future of the USA economy, real estate, commercial lending and home building with our best yet to come. To read the latest transcript for this topic, please click here. Bob Miles (Genius of Warren Buffett Course). Warren Buffett readily admits that Berkshire Hathaway (now America's 6th largest company) would not have existed without the influence and guidance of his late first wife, Susan. She also helped shape his charitable and political beliefs steering him away from his boyhood and his father's deeply held governmental philosophies. His long time editor, his bridge partner, and even his closest adviser are female. Several women entrepreneurs and professional managers have sold their businesses to him. 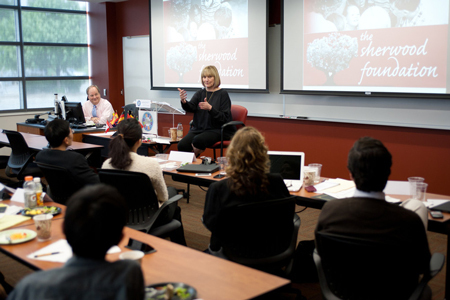 Guest Speaker, Susie Buffett, explains to students about the Sherwood Foundation. His conglomerate has two women directors and his family foundation has a majority female board. And one of his largest public investments of $11 billion has a woman President and CEO. Warren is optimistic about the future of the USA economy, primarily because of the impact women will make as their full potential is unleashed. A fascinating review and update of one of the world's largest companies, Berkshire Hathaway and longest serving and renown CEOs, Warren Buffett. This presentation reveals some valuable insights by someone who has studied, written and lectured about the company and its management team for over a decade. Since Berkshire Hathaway is a unique conglomerate made up of $70 billion in various publicly traded securities plus a diverse group of wholly owned companies, it provides the average investor with excellent investment lessons and market signals. What are Buffett's economic moats and how to increase and sustain a fortress around your investments? 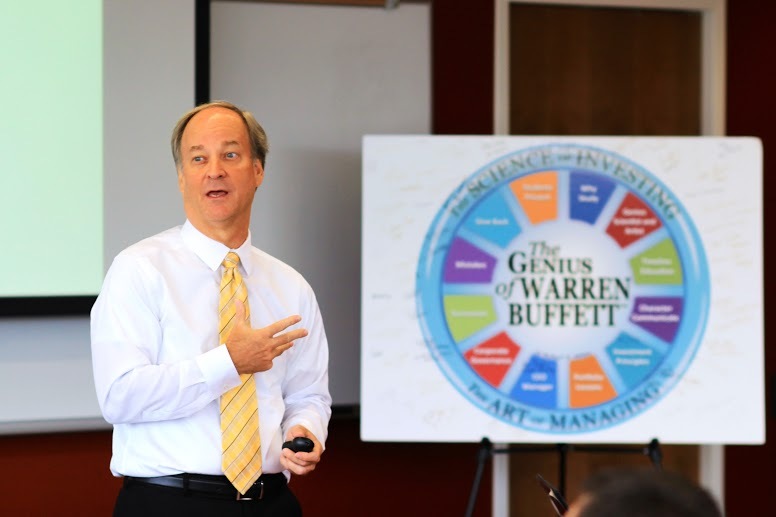 A multimedia presentation by a distinguished lecturer who has created and taught the world's first Executive MBA program on the life and investment genius of Warren Buffett. Learn the fascinating tale of a man who has created wealth not by starting a business, not through inheritance, or inventing a new process, nor by manufacturing a unique product or even capturing a patent, but rather by starting with a small portfolio and building it into one of the world's largest fortunes. 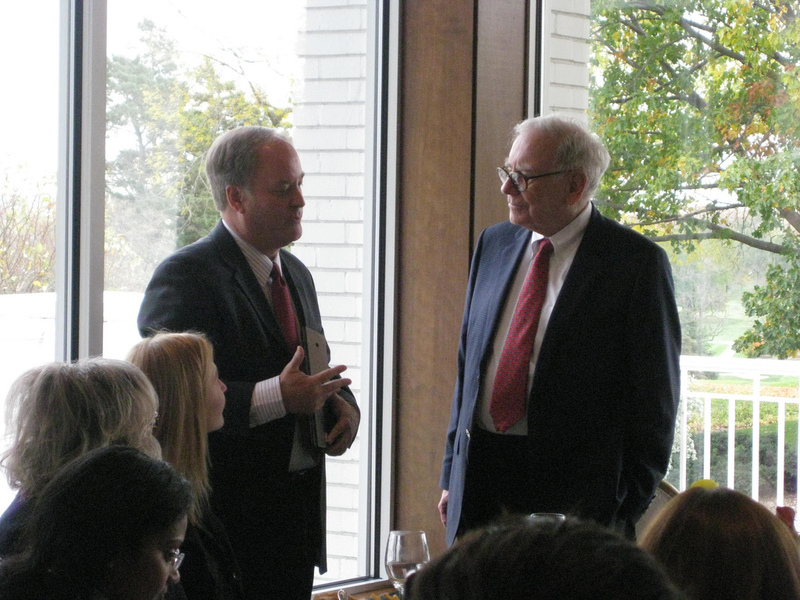 The Secret Billionaires' Club: Why Study Warren Buffett? Contact Robert P. Miles for your next corporate or eductional speaking agenda! 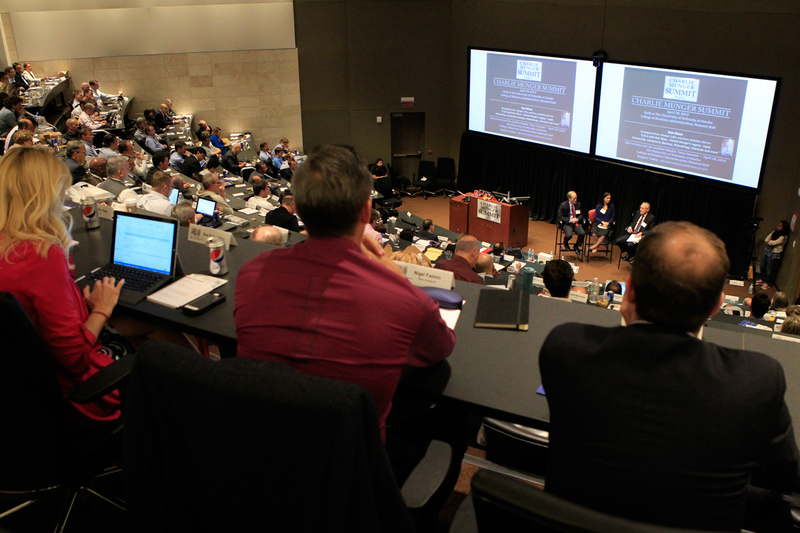 The first of 12 in-depth sessions on the extraordinary life of a financial, management, business and charitable legend is a brief introduction to the course now available to Executive MBA students and lifelong learners from around the world. Most, if not all, titans in business and philanthropy amassed their wealth through the timely development of a product or service or the old fashioned way: inheritance. Buffett stands alone by not having developed a unique business but rather by investing in businesses through the stock market or acquiring wholly owned businesses. As a result, his enterprise, Berkshire Hathaway, prospered into one of the world’s largest and most profitable such entities. An introductory look into the principles and practical methods used by the world’s greatest investor, CEO, chairman, director, philanthropist and educator. This presentation explains why all investors should study Warren Buffett: What unique gifts of birth, well-developed character traits and habits have enabled him to become one of the world’s most successful investor and most admired chief executive? A simple yet effective business valuation method using very simple math skills, which was taught to him by his graduate school professor, will be revealed. Also shown is how this technique has been successfully used in his five decade long history of acquisitions, which built and sustain Berkshire Hathaway as one of the largest and most profitable global enterprises. While this is a graduate level university course designed exclusively for Executive MBA students and UNO graduates, lifelong learners of all ages may enjoy this introductory session. Proven and documented principles used by the world’s most successful investor are examined in-depth. Learn how to apply these easy methods no matter what your age or experience. Understand what to know before you make an investment, how to determine if you are on the right track, and where to find valuable investment ideas. Synopsis: Surprisingly simple and easy to understand strategies used for over six decades by the world’s most successful investor. Carefully analyze each stock in Warren Buffett’s corporate and pension fund portfolio and understand why they were selected. Understand a simple valuation method used by Warren Buffett to apply to your investments. Workshop will include an actual stock purchased along with a careful explanation of its valuation. How you can construct a world class portfolio without the benefit of a calculator or computer. This presentation is more than theory, mystery or magic to portfolio management, instead proven principles and techniques to impact your personal finances for a lifetime. A short economic briefing with the same data that the world’s foremost financier shared with the President of the United States. Berkshire Hathaway’s ever expanding group of wholly owned companies provides a leading economic indicator of the country’s gross domestic product, employment, retail sales, housing, mortgage, and consumer debt. Learn how the most current information can help you with your investments. A short and current state of the United States economy and how it may relate to your overall investment strategy. Unique profiles, common characteristics, and management secrets of Warren Buffett's management team. Miles is the author of The Warren Buffett CEO, a book that provides a unique, inspiring view into the lives, values, and management styles of the CEOs of the businesses comprising the Buffett empire. While researching the book, Miles discovered common traits among more than 20 CEOs of Buffett-owned companies, including: high ethical standards, integrity, and an impressively high energy level. Miles shares stories that every businessperson can learn from and imparts information they can implement in their own business practices. How his success as an investor and as a manager is directly related to his ability to surround himself with people he likes, admires, and trusts. Hold a mirror up and see if the person you have become reflects the character traits admired by this most renowned value investor and values manager. Learn exactly what type of manager is admired and trusted by Warren Buffett and how you can become more of the person that you admire. This presentation addresses what character traits are necessary for successful investing. 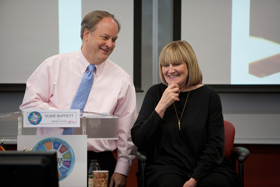 Find out how Buffett has been able to attract and keep such a talented team of managers without meetings, divisions, budgets, or an organizational structure. Examine why most shareholders and Buffett followers over-emphasize the importance of Berkshire’s CEO naming his successor, not realizing that the real value is in each of the managers running each subsidiary and partly owned business. Gain insight into the character traits of a Buffett manager and how can they be integrated into the everyday lives of all those who choose to adopt these traits. Learn why "Team Buffett" has never lost a CEO to a competing enterprise even though the average Buffett CEO is worth $100 million and therefore "working" for passion, not financial independence. Find out why the typical large-company CEO is on the job for only 6 years in contrast to the average Buffett CEO, who has a tenure of 25 years – with no mandatory retirement. This presentation is a careful examination of Berkshire Hathaway’s unique business model. It shows how this conglomerate evolved and how it will look well into the future. It tells what will happen after Warren Buffett retires and how he will judge his successor. The answers may surprise you. 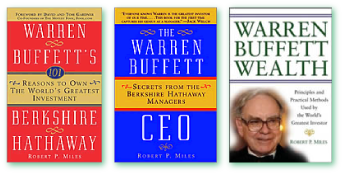 This is an in-depth and multi-media review by Buffett Wealth author Robert Miles of simple principles used by Warren Buffett to become a multi-billionaire. Beginning students as well as professional investors will be informed and entertained by Buffett’s practical, value-based, and ethical investing methods. There are four ways to wealth and only one involves skill. This presentation explores the easily learned beliefs and practices of the world’s most accomplished investor. Without ever starting or operating his own business, Warren Buffett has created enormous wealth by investing in other people’s businesses. As a young boy in Omaha, Nebraska, Warren Buffett began his investing career with a modest investment of $100 and transformed it into over $100 billion -- one of the largest fortunes ever. According to Forbes magazine, Buffett is the second richest person in the world. And he did it by sticking to his principles, staying clear of unfriendly deals, and going into business with people he likes, admires, and respects. Learn about "margin of safety" and why it's one of three important cornerstones and lessons taught to Warren Buffett. Understanding and only investing within your circle of competence is an overriding theme of building Buffett Wealth. An excellent example may be his billion-dollar purchase of Coca-Cola, a product he understands and consumes daily. Gain insight into Warren’ s mentors and what they taught him. Find out why you should think of a stock like a bond when calculating values; the world’s greatest investor believes that all investing is value investing; see how Buffett calculates a stock’s value. Learn to recognize the never-before-seen "Mr. Market," that fictional character created by Buffett’s professor to help explain the two extremes of the stock market: fear and greed. Bid on an actual business purchased by Warren Buffett and uncover all the lessons learned from this transaction. Understand the difference between quantitative and qualitative forms of investment and how Buffett calculates and discovers them. Carefully review Buffett’s actual stock portfolio and see what you can learn from it. Discover why successful investors concentrate their ownership into a few wonderful stocks. Find out why Berkshire goes against conventional wisdom and refuses to split its stock. Hear about Warren Buffett's mistakes and what lessons you can learn from them. 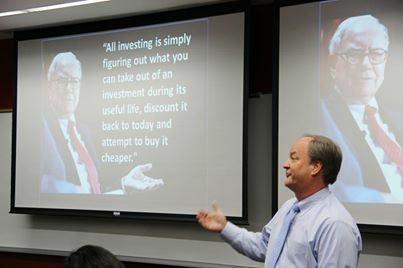 This presentation reveals and debunks many myths about investing, wealth creation, and Buffett himself. It describes who the next Warren Buffett will be and what his investment principles are. It explains "the circle of wealth" and how most of the Buffett Wealth (his and his shareholders) will be given back to the world. Finally, it explores some of life's lessons from a man of wealth, genius, power, and character. A business analyst (understanding a business) or a market analyst (understanding mass psychology) – which one are you? Since most, if not all, investors prefer rising bull markets, why would the world’s greatest investor prefer the opposite? While the majority of stock market participants invest using methods that are completely opposite to the way the masterful stock picker, learn how you too can outperform declining markets and take advantage of extraordinary market values. During times of uncertainty is when the stock market offers the most bargains. All investing in value investing, paying out money today with the belief that you will be paid more in return at a later date. Learn why the stock price is the last thing that Warren Buffett looks at and what instead is his first action evaluating a stock or a business. Find out how the famed financier reduces his risk and confidently allocates capital during times of crisis. Review his latest stock and industry selections and understand why long term holds reduces risk. It is comforting to learn that all superinvestors have had losing years, even Warren Buffett. Learn what he said after the last significant market crash and who many years ago Buffett warned all who would listen that most financial stocks were dangerous and speculative investments. Description: Discover the relatively unknown and the only person approved by Warren Buffett to replace him as chief capital allocator at Berkshire Hathaway. He currently manages a multi billion dollar all equity portfolio for a wholly owned subidiary of Buffett's conglomerate. Unlike his boss, he invests more like the average private and professional investor in publicly traded equities, without holding cash or fixed income, wholly owned subsidiaries, warrants, or special preferred deals. Learn how he has been able to out-perform the returns of Warren Buffet as well as the 500 largest companies in the USA with a totally different mix of stocks than his more famous counterpart. He is proof that Buffett like market beating returns are more than luck and indeed can be duplicated without picking the same stocks. Studying Warren Buffett and learning his methods is one of the wisest things a stock market participant can do, but because of the size of his capital base, his access to low costs funds with insurance float, and his ability to invest in whole businesses makes tracking his stock market investments less effective to both the private and professional investor. Out of 10,000 stocks publicily traded in the USA, only 2 percent or some 200 are big enough and therefore appropriate for Buffett. Instead study someone who is approved and admired by Berkshire Chief Capital Allocator and has most of the 10,000 stocks available for ownership along with other international stock exchanges. It is also comforting to learn that, like most investors, he has had down years and he doesn't have to be an expert on anything other than equities, including small, mid and large cap, international and even technology. This superinvestor (adding value over a long period of time) follows very simple and easy to understand principles. The portrait of this disciplined investor shines a spotlight on the most likely successor to replace Warren Buffett and chief investment officer of Berkshire Hathaway. While Warren Buffett's holding company Berkshire Hathaway has built an extraordinary portfolio of companies along with a remarkable team of CEOs, he has also attracted the best board of directors in the world. Find out how he did it and what criteria he uses to assemble his board. What are the underlying corporate governance philosophies of Berkshire and how they have evolved. Twenty fire years ago Warren Buffett wrote and issued an ‘Owner’s Manual’ that outline Berkshire Hathaway’s basic business principles. In the very first principle, Buffett states his guiding corporate governance mandate as a partner with the shareholders and makes sure that his interest is identical – to insure the long term progress of each of the businesses it owns. Learn how Berkshire’s Chairman and CEO gives a full, fair and transparent annual report, followed by a one of a kind shareholder’s meeting. 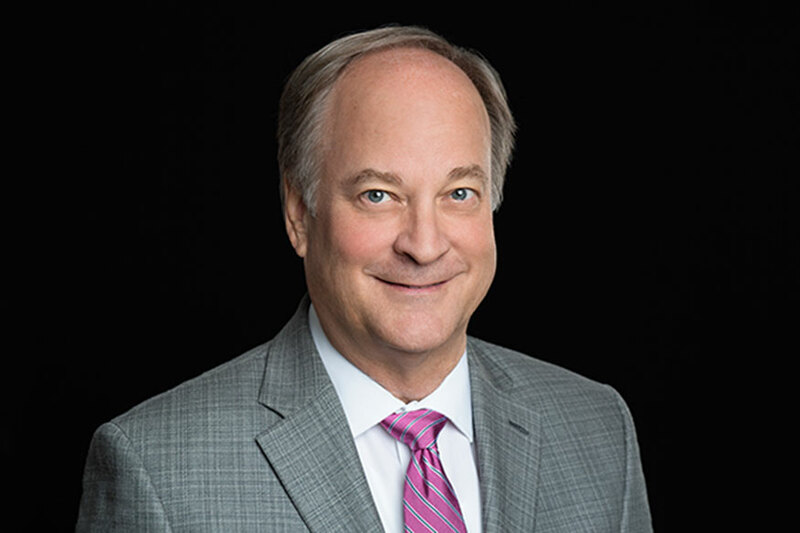 Find out why this exceptional corporate leader avoids typical quarterly guidance and CEO predictions that create artificial targets that inevitably lead to unwholesome maneuvering with regard to earnings statements. Buffett corporate governance addresses the often-difficult relationship between board of directors and CEOs. Buffett says, ‘it is all too common for inadequate people in the latter positions to be tolerated indefinitely because performance standards for their jobs rarely exist (in contrast with that of subordinate positions) and because directors often are incapable of or unwilling to make needed changes.’ Discover how Berkshire’s governance and deeply rooted business philosophies eliminate these problems. And more importantly, how Berkshire attracts the most talented managers and keeps them well beyond traditional corporate retirement age. Building a world-class corporate board and management team without the use of stock options – an executive benefit that has proven to be detached from their real job performance. Learn how the Berkshire managers have an incentive compensation plan that is based on that which is in their control and results achieved, rather than on the stock price. 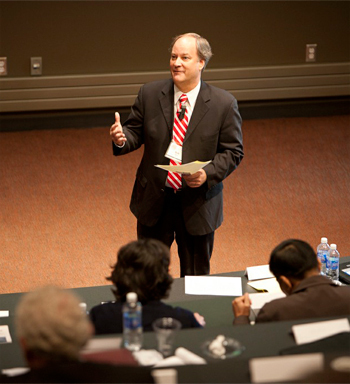 Bob Miles's topics are engaging, informative and inspirational for a variety of corporate venues. Large or small audience groups will benefit from his affidable, congenial delivery of topic material on Management, Investment, Finances, Leadership and more.... topics that are not only understandable to most business-oriented audiences, but also insightful information for their business and personal enrichment. Bob Miles's presentations are appropriate for many business venues, including: annual meetings, conventions, speaking and book signing programs, corporate meetings, iInternational meetings, boardroom keynote, investment groups/clubs, or more individualized one-on-one interactions with specialized groups. Mr. Miles makes presentations worldwide. How do we get Bob Miles as a speaker for our investment group in Switzerland? University level students for both graduate and undergraduate courses will find Bob Miles's depth of knowledge in Management, Finance, Investment, and Business Ethics engaging and loaded with useful tools and guidelines for their future or current careers in the business world. Robert Miles has presented to students at EMBA, MBA and BSB levels. His appealing manner of presentation is readily enjoyed by his student audiences. Credit courses, seminar keynote, seminar lecturer, graduation guest speaker, seminar guest lecturer, undergraduate level lecturer, graduate level lecturer, business college keynote and individualized class presentations are a few Educational venues. Bob Miles lectures at most all international locations. We'd like to have Bob Miles as our Keynote Speaker. How do we get in contact with him? Jack Welch says: "Everyone knows Warren is the greatest investor of our time… [Robert Miles] for the first time captures his genius as a manager." Warren Buffett says: "Everyone who reads it comes away singing its praises. I'm mentioning it in the annual report." "Everyone enjoyed your presentation - they are now all reading your book." More Testimonials for Robert Miles!